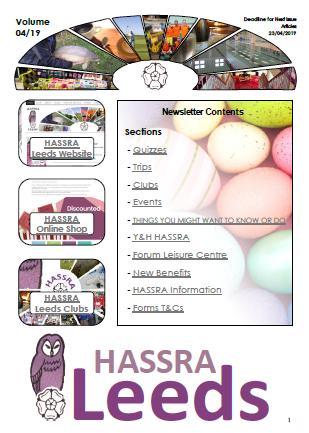 HASSRA Leeds is run by volunteers like you. 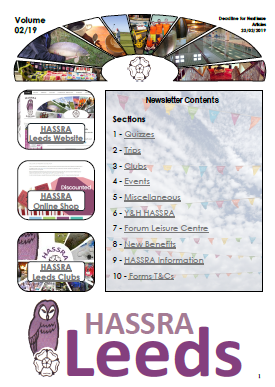 If you want to be involved as a member of the Board of Management, or help organise events, clubs, activities, or communications, now’s your chance! Our Annual General Meeting will be held on Tuesday 20th February at 12:30 in the Woodpecker Bar when we’ll be voting on roles and responsibilities in the club for 2018. 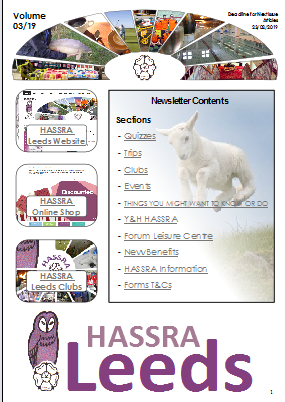 If you are interested, complete the relevant nomination form, have it nominated and seconded by HASSRA Leeds members. E-mail the completed nomination form with a brief pen portrait of yourself to Simon Jarrold SIMON.JARROLD@DWP.GSI.UK or by post to: Room 3S25, Quarry House, Quarry Hill, Leeds LS2 7UA by 9th February at the latest. All nominations received will be used in the election process at the AGM. There will be an update and hard copies in January. Merry Christmas, Happy Holidays and a Happy New Year to all. The walk, organised by Carol Rutherford and Mick Morby, will be of easy grade and tailored to the weather on the day, taking us through country lanes and fields to Killinghall and likely to be back along the disused railway line, now a “Greenway” that takes us over the stunning viaduct by Bilton Beck Wood a “Site of Importance to Nature Conservation (SINC)”. Weather and mud levels will determine the length of the walk which will be between 5.5 and 6.5 miles. We meet in the Car Park of The Knox Arms, Knox Lane, Harrogate HG1 3AP where we can leave our cars and will be returning for lunch. Meet at 10:15 for a 10:30am start. There are toilet facilities in the pub. If you want to come for lunch only the tables are booked for 13:45pm. If you would like a lift on a petrol sharing basis, please contact the organisers. We will let you know if someone is travelling from your area. The no 36 Transdev Leeds to Ripon bus. These run every 30mins to and from Leeds via Harrogate bus station. Transfer to the 2b bus below. Good departure times from Leeds are 0815 and 0835. Alternately, you could catch a train and transfer to the 2b bus. The 0859 train service from platform 1a would be good. 2B buses from Harrogate bus station (Stand 4) stop on Knox Lane adjacent to the pub. Buses run every 30 minutes up to early evening. It takes around 20 minutes, traffic permitting. The 0940 service is perfect for a good arrival time. It will be cold and also muddy in places. Stout shoes or walking boots, several layers of clothing and as always wet weather protection may be needed. The Knox is a converted a 300 year old former farm house and farm building in a quiet suburb, on the fringe of Harrogate. It is a very attractive ‘Local Community Pub and is well known for its home cooked food. The Christmas Meal menu is attached, 2 courses for £16.95, 3 for £19.95. Let us know your selections. We will need a £5 deposit per person when booking. Thank you. Please send your deposit (£5 per person) Mr M. Morby, 16 Fieldway, Harrogate. HG1 3JZ. The closing date for the meal reservations is 17 November 2017. Contact me for information concerning any reservations requests beyond the closing date. There will be a £5 subsidy for members of the Walking Club. Contact Mick 07948 381876, email mix.morby@gmail.com or Carol Rutherford, mumwee1962@yahoo.co.uk with your menu selection(s), also for alternate payment methods or additional information. – Ferry charges for evening meal & breakfast is £24.50 each way (£49 return). Sun 24th – Executive coach collection from Quarry House to Hull North Sea ferry for overnight travel to Zeebrugge at approximately 3.30 pm. There will an evening chocolate workshop with David on-board. Mon 25th – Executive coach travel from Zeebrugge to Bruges – arriving mid-morning. Guided walk with David, guided walk with the Walking Club, Brewery Tour and/or free time in Bruges. Check in the IBIS Centruum Hotel – there will be a chocolate demonstration in the evening. Tues 26th – Guided walk with David, guided walk with the Walking Club, Brewery Tour and/or free time in Bruges. Executive coach travel from Bruges to Zeebrugge, returning to the ferry for the overnight crossing to Hull. Evening chocolate workshop with David on-board. IBIS Bruges CentruumIBIS Brugge Centrum is located in an ancient medieval building in Bruges’ city centre, within a 15 minute walk of the Markt. Close to the hotel, you can visit the Belfry Tower, the Church of Our Lady and the Lake of Love, Minnewater Park. The hotel has 128 rooms, a bar open 24/7 for snacks, and a restaurant offering regional specialties. Guests can also enjoy the free WiFi. The extensive ibis buffet breakfast is served from 6.30 to 10.30am. The Macmillan Coffee Morning and subsequent events raised a total of £1821.67 which is a record for us! Well done and thanks to all those involved. Especially to Simon Jarrold who puts so much effort into these events, and also all the bakers and contributors. The money we have raised will not only go to meet the medical needs of people affected by cancer. Macmillan Cancer Support also assist people with the emotional, social and practical impacts that cancer can have on them.